Cookie is a beautiful 2-year-old black female with 4 white paws and a stunning white chest. She was born in 2002. Cookie's tattoos are illegible, so her history is unknown, although she arrived with Bella and Gable. Cookie's coat is smooth and very shiny. She is initially a little timid, but warms up, especially with a little food for motivation. Her disposition is very sweet and she is petite, weighing only 53 pounds. It is not known at this time if Cookie is cat or small animal tolerant. We have had the wonderful opportunity to be foster parents to Cookie. She has come into our household and touched our hearts. 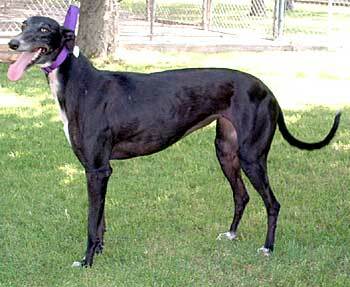 She is a very happy greyhound who wags her tail constantly. We have two other greyhounds, Root Beer and Angel, and Cookie has made herself friends with all. 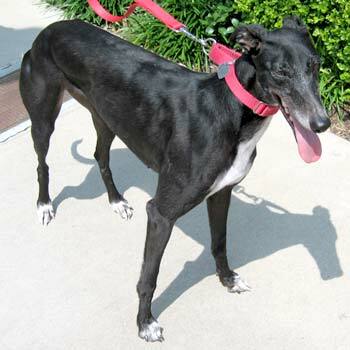 She is a very affectionate grey who enjoys either being at your side or with her two new buddies. On walks she is constantly introducing herself to anyone who passes by  she loves to meet people! She is housebroken as long as you heed her little whimpers at the front door. 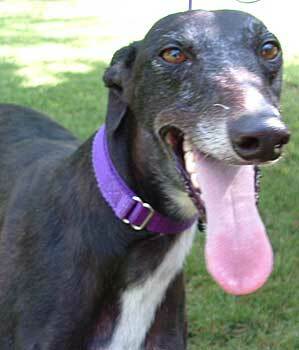 Cookie would be a Greyt addition to any household.